Under Peter the Great, Russia started to speak the same language as Europe — in donning clothing that was familiar to Westerners, Russian bureaucrats ceased to appear as half-savage Slavs in the eyes of foreigners. Nikolai Gogol famously penned “The Overcoat”, the allegorical tale of a petty bureaucrat who loses his social standing. 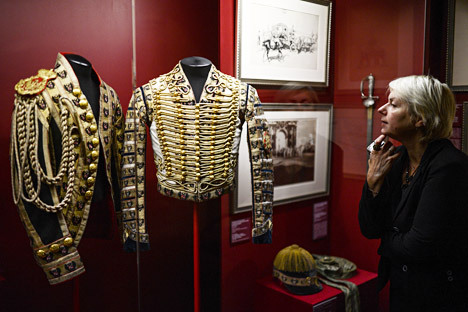 The story symbolizes the role of the formal coat and uniform in Russia, where it was not merely a garment, but a symbol of dedication to one’s country. In 1722, Peter the Great approved the Table of Ranks, a groundbreaking register of civil and military positions that systemized the Russian bureaucratic machine in the European manner. Every rank had a corresponding uniform, which thenceforth made it possible for anybody to precisely identify a bureaucrat’s job and his position in society. The clothes make the man: For young men, this was one of the most important arguments in favor of employment, including civil employment. Even lowly newspaper vendors wore special clothing: a long, double-breasted coat with a peaked cap and a distinctive small bag slung over the shoulder. The uniform also helped the government’s image: Under Peter, Russia started to speak the same language as Europe — in donning clothing that was familiar to Westerners, Russian bureaucrats ceased to appear as half-savage Slavs in the eyes of foreigners. Peter the Great himself wore a uniform of exceptionally domestic making. In fact, the uniform catalyzed the establishment of a textile industry in Russia, spurring the development of clothing production. Huge government orders for ready-to-wear uniforms stimulated the shift from the small-scale artisanal production of fabric and garments to full-scale manufacturing. The Russian empire was the country of the uniform. From the college to the government office, all working men or students wore a uniform that was approved by the tsar. Charts with detailed descriptions of the cut, colour, ornament, material and even the measurements of these outfits were published in the texts of the laws. Every tsar personally approved and adjusted uniform designs as he saw fit. Women were not affected by this issue. There were tacit recommendations that workers in educational and medical establishments wear modest colours and chaste garments that were virtually devoid of extra adornment — for the most part, women wore dark-coloured, high-collared dresses. Every educational institution and government department had its own uniform, which came in several versions: formal, everyday, day off, winter, summer. For example, officers in the heavy cavalry guard had five or six uniform changes. Rank-and-file soldiers of the same regiment had three different uniforms. Moreover, within each government department, the uniform differed depending on the wearer’s class and rank. The pattern and placement of the stitching varied, from the formal uniform of a low-ranking bureaucrat to that of a collegiate registrar (14th rank), to that of a collegiate councillor (6th rank). In addition to the coat, the headwear came in different shapes and with fur trimming of various colours. There was even variation within a single government department and for identical positions. Workers who served at the “headquarters” dressed differently from those who worked for “representatives in the provinces”: Those in the government’s central offices wore buttons decorated with a two-headed eagle, while their colleagues in the provinces wore buttons with the province’s coat of arms framed by a laurel wreath. The shoes were black laced boots. High boots were permitted only with a double-breasted jacket, greatcoat or frock coat during missions. According to Soviet historian Yakov Rivosh, “Distinctive insignias based on rank were the same for all the ministries and government departments. They were fastened to the stripes or the shoulder straps,” writes Rivosh. The dress coat worn by senators, which was sewn with golden thread, was worth one month’s salary for a minister. The coat’s prestige was so great that even merchants and manufacturers, who were far removed from government service, envied it. They gave substantial donations (hundreds of thousands, and even millions of roubles) to the Offices of the Empress Maria fund, which was maintained as a trustee for orphanages, homes for the elderly, hospitals and other charitable institutions. The reward for benevolence was the right to wear the striking uniform of this office. Moreover, the lavishness of the uniform depended directly on the size of the donation. The universal use of uniform came to an end with the dissolution of the monarchy. Nowadays, only workers in some military departments and judicial agencies wear uniforms. However, the uniforms of the Tsarist era have made something of a comeback of late, inspiring designers like Russian Anastasia Romantsova. In creating her fall/winter pre-collection for 2014–2015, Romantsova turned to the motif of the Russian dress uniform, using ribbons and orders on starched collars and other flashy elements of the coat. Furthermore, bureaucrats are now more often acknowledging the uniform’s powerful ability to discipline and unite. “Police officers wear the same uniform and they are recognized. The bureaucratic administration that services the government should also be recognizable. They should wear tasteful outfits,” said Dmitry Malov, a deputy in the Troitsky District Assembly, in an interview, proposing that all Chelyabinsk Region bureaucrats be dressed in identical, but stylish, uniforms. The triumphant return of the Overcoat is in the offing.